The Storm Youth Championships (SYC) was held in Reno, Nevada, March 23-25, 2018. More than 270 youth bowlers from 29 different states, one bowler from Liverpool, England, and their families traveled to compete at the National Bowling Stadium. The youth bowlers competed in four five-game rounds on four different Kegel patterns in six different divisions determined by gender and age (U20 Boys, U20 Girls, U15 Boys, U15 Girls, U12 Boys, U12 Girls) for a national title and a portion of the $20,975 scholarship fund. The 2018 SYC champions demonstrated consistency across all four patterns and each bowler led their division by at least 100 pins. Alex Aguirre, of California, captured the U20 boys title 164 pins ahead of the competitors in his division, while Mabel Cummins, of Illinois, dominated the U20 girls field in her first SYC event with a 327 pin lead. Spencer Robarge, of Missouri, earned two SYC titles in 2017 in Reno and Myrtle Beach. Robarge led the U15 boys division by 214 pins to defend his title and earn his third SYC crown. Melanie Katen, of California, picked up her first SYC title 214 pins ahead of the bowlers in the U15 girls division. In our U12 division, Micah Voorhis, of New Jersey, captured the boys title while Saphyre Nofuente, of California, earned the U12 girls title. The top three bowlers in each round were presented a gold, silver, or bronze medal. After the four rounds were complete, the tournament champions in each division were crowned based on their 20 game pinfall. The top two competitors in each division were named to the Storm All-American Team. Sebastian Huffman, Ashtyn Woods, Ashton Yamasaki, Jennifer Loredo, Nicholas Postag, and Caroline Thesier will join the champions on the 2018 Storm All-American Team. Throughout the weekend participants and their families were able to attend a seminar with Dr. Dean Hinitz, meet and practice with members of the Storm Bowling Pro Staff, and discuss lane play strategies with Storm representatives. To celebrate National Puppy Day, Blake the Bowling Doodle also made a special guest appearance to meet with the youth bowlers, signed paw-tographs, and rolled the ceremonial first ball of the tournament. Every bowler who entered the tournament received a Storm !Q Tour bowling ball and were given the opportunity to have it drilled in the Lane 81 Pro Shop on site. Charitable giving is a focus at Storm therefore we chose to align our SYC tournament with a worthy charity. A donation of $10 out of every entry goes directly to BVBC also known as Ballard vs. the Big “C.” BVBC raises funds for continued research in cancer treatment, specifically in head, neck, and throat cancer through the sport of bowling. BVBC also raises money for nutritional supplements and treatments for those going through the cancer journey. The Ballard Family was on site to host a BVBC silent auction, raffles and more throughout the weekend. The SYC event raised more than $10,000 for BVBC. Additionally, Jim Callahan, Storm Tour Representative, and his wife Keli, have created a new scholarship to be awarded at the 2018 SYC events. 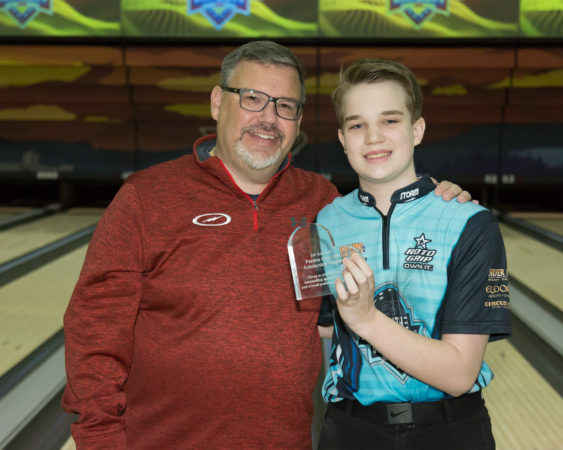 The “Passion Pays Off” Award and a $500 scholarship will be presented to a bowler who exemplifies sportsmanship and passion towards the game of bowling at each event. The inaugural “Passion Pays Off” scholarship was awarded to Jimmy Hunter. This tournament would not be possible without the support of our sponsors; Storm, Roto Grip, Logo Infusion, Turbo 2-N-1 Grips, Kegel, 3G Shoes, and the Eldorado Resorts. The event was livestreamed to an audience of more than 600,000 people throughout the two days of competition on the Storm Bowling Facebook Page. The SYC will travel to Smyrna, Tenn., May 25-27. This event is sold-out with a waiting list. We will return to Myrtle Beach, October 12-14 and visit Fort Worth, Texas, November 30-December 2. For information about our upcoming events visit our website, http://www.stormbowling.com/syc or check the StormJr Facebook Page.